"Reopen ALL Clinton Crimes Investigation"
Why does the obvious criminality of the Clintons ALWAYS go unpunished—uninvestigated—uninterrupted? 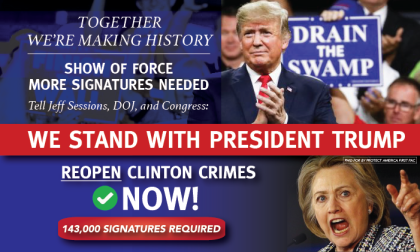 Americans—tired of the Clinton crime dynasty—see their countrymen prosecuted for the slightest crimes and the most humble Americans live in fear of small transgressions, even persecutions. But big league criminals like the Clintons—career criminals really—seem protected by big league politics from both parties. Why? Is the fix on? Why must non-prosecution of the Clintons be part of your personal legacy? Three decades of Clinton and Clinton Foundation crimes—selling secrets, illegal donations, foreign pay to play donations, campaign fraud, Benghazi, perjury, extortion, theft, embezzlement, mail and wire fraud, destroying evidence, tampering with witnesses, taxes, rapes—dozens of mysterious Clinton homicides, and three decades of sexual predation and Clinton cover-ups… And the Justice Department won’t touch her? The fix is on or someone would act and no American who is expected to obey laws can be expected to tolerate “special immunities” for some. My signature below stands with thousands of other Americans to say: enough. Act now—we believe in you and believe in the rule of law—for everyone. You will only be Attorney General once but your legacy will live forever.